Are you looking to book major comedians, music artists, speakers or celebrities? 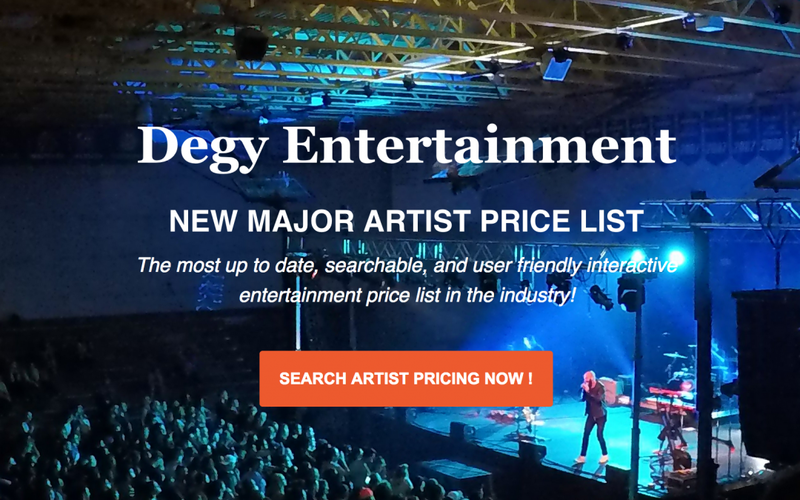 We are excited to launch a unique, real-time, interactive price list on our website ( https://www.degy.com/resources/ ). This price list will be constantly updated with new names that come available, tours as they are released, and other tools to be announced. Want to know what your friends at other SAB and CAB boards are excited about? Going forward, we will be able to post details and charts for you to watch the trends too! As we work to help our 200+ college, middling clients with their major event bookings, we are also working on unique ways to help our schools pay for the talent. The new partnership we’ve set up with RECESS allows our schools interactive access to sponsorship dollars and product for big events. Have you reached out to us about this new deal we have? Send us an email to info@degy.com with subject “RECESS” and we can tell you more and make an introduction to potential funding!